Award-winning journalist John Pilger investigates the discrepancies between American and British claims for the 'war on terror' and the facts on the ground as he finds them in Afghanistan and Washington, DC. Pilger also interviews presidential candidate General Wesley Clark, and former intelligence officers, all the while raising searching questions about the real motives for the 'war on terror'. While President Bush refers to the US attacks on Afghanistan and Iraq as two 'great victories', Pilger asks the question - victories over whom, and for what purpose? Pilger describes Afghanistan as a country "more devastated than anything I have seen since Pol Pot's Cambodia". He finds that Al-Qaida has not been defeated and that the Taliban is re-emerging. And of the "victory" in Iraq, he asks: "Is this Bush's Vietnam?" "Astonishing...should be required viewing in every home, school and office. With facts bristling from his fingertips, Pilger revised the Bush/Blair version of events leading up to the conquest of Iraq to reveal an agenda of unprovoked aggression, excused and obscured by ruthless manipulation of September 11." "BREAKING THE SILENCE is a film with enormous emotional power, bringing us the human consequences of our military attacks on Middle East countries. It also provides us with important insights into the reasons for these cruelties, exposing the emptiness and hypocrisy of the claims made by the Bush administration that it is fighting terrorism and promoting freedom. I wish this film could be shown in every classroom in the United States, to guard young people against the lies they will hear from on high, and to prepare them to be active citizens in the struggle for a peaceful world." "In 52 minutes, John Pilger succeeds brilliantly where the U.S. mass media have failed miserably -- to examine the war on terror with tough-minded humanism and uncompromising journalism. The result of Pilger's efforts is a powerful expose that demolishes the pretensions of George W. Bush and Tony Blair. In 2004, we need Pilger's documentary BREAKING THE SILENCE more than ever. From Afghanistan and Iraq to New York City and the insulated bastions of power in Washington, this film jolts us to consider the real human costs of flagrant lies still being told in high places. Whether you live in the United States, Britain or anywhere else on the planet, BREAKING THE SILENCE shatters some key myths that often prevent us from developing news media and political priorities to protect human life instead of destroying it." "Provides a frighteningly lucid account of President George W. Bush's potentially never-ending war on terror." "This Special Report by John Pilger is as welcome as it is contentious." "Another inspirational hour from John Pilger, which feels like hitting an air pocket after drowning for years in the deluge of 'with us or against us' on-message, embedded reporting." "Raises crucial questions about the real motives behind the violence...Pilger [makes] a very valid point about the terrible distance between the public statements of the American and British Governments and the actual actions they have taken." "A compelling documentary, almost haunting at times, which takes one of the biggest political bones...and chews it to pieces...[BREAKING THE SILENCE] is as disturbing as it is compelling and, undoubtedly, some of its claims will sound long and loud after this hour ends." "Hard-hitting and thought provoking...spectacular archival and contemporary video footage...raises some unsettling questions that can generate effective discussions in current affairs curriculums." "Provides an important foundation to understanding how the wars in Afghanistan and Iraq began and why they have devolved into catastrophic endeavors... [BREAKING THE SILENCE] should be required viewing for those who are increasingly concerned about the lack of results in the war on terror. Highly Recommended." "Pilger's willingness to probe makes this a welcome counterpart to the often too-credulous mainstream media. For public and academic libraries." "Remind[s] us that you cannot achieve peace and justice without universal respect for human rights." 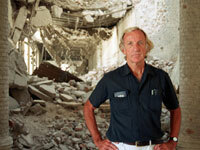 "With a subject so loaded, writer-journalist John Pilger must marshal-and succeeds at doing so-an impressive array of speakers whose many areas of expertise contradict official versions and confront the placidity and ignorance of the U.S. viewing public... Pilger's message has historical importance for concerned citizens, but it is important for students of anthropology, in particular. It can make significant contributions in classes on the anthropology of human rights, political and visual anthropology, the Middle East, unpopular culture, women's studies, and discourse analysis. Breaking the Silence presents a model of courage, because it speaks truth to power. Pilger confronts high-ranking Washington war spokesmen and think-tank dogmatists unflinchingly, and with a mastery of facts... The film is of interest to anthropologists of media because it experiments interestingly with media styles and worlds, juxtaposing ethnographic interviews, verite footage, processed imagery, and televised mainstream speeches." "Politically unapologetic and relentless... Piercing the verbosity over the economic development aid and the liberation of women in Afghanistan, Pilger's camera records the devastation of living conditions and the continued violence agaist women... appropriate for a Western classroom to deepen the student's understanding of Iraq and the complicated realities of the war on terror... Breaking the Silence presents a hard edged expose of the war in Afghanistan and Iraq."